Why Promotional Pens & Pencils? 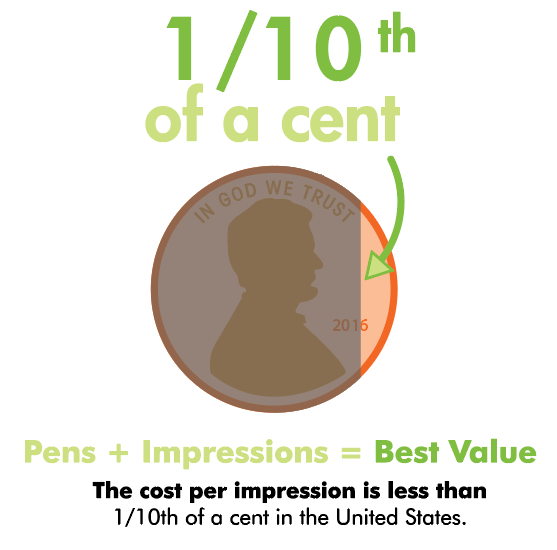 Pens are one of the most inexpensive and useful promotional products you can find. When was the last time you used a pen that didn’t have someone’s logo on it? As one of the original promotional products, pens just flat out work! There is a reason they’ve been around for so long in the promotional marketplace. For not too much of a marketing investment, companies can see their brand come to life on a custom imprinted pen. At only 1/10th of a cent per impression, put them in the hands of every client, employee and strategic partner. Put them on your tradeshow table, leave them at the bank and restaurants you visit, and you’ll find advertising that truly lasts! If you are looking for a nicer gift, there are also metal rollerball pens to use at important contract signings and deal closings. Pencils are great giveaways for organizations appealing to kids and schools. In general pens have a very narrow imprint area. Many height restrictions allow you only 1/4″ high to fit your logo. We often have to adjust artwork to fit the space and make sure we keep your brand integrity while ensuring that your information is legible. We also have certain vendors who can get you a much larger than normal imprint area. Metal vs Plastic. The most affordable pens are made from entirely from plastic. They get more expensive as you add metal accents and comfort grips. The more expensive pens are made from entirely metal and some have better ink. I consistently rely on Jamie and her team for their product knowledge and expertise. Thanks to Promotional concepts for helping our team look professional in every circumstance.